Bite Beer Company's First Bite Pale Ale is the one I'm checking out today. 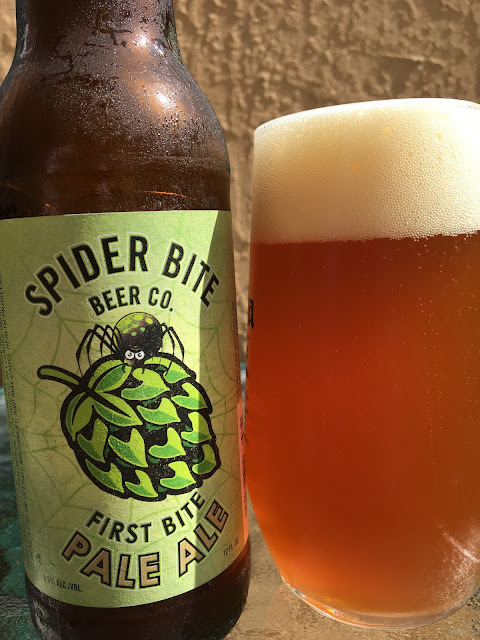 Simple label with an angry spider crawling on a hop cone. The beer is named "First Bite" because it was the first beer the Spider Bite team brewed together. 5.5% alcohol. 30 IBU. Caramel and lightly hoppy aroma. Caramel forward on the flavors too. Crackers are also prevalent, but a medicinal hoppy takeover comes next. Sourdough, spicy, leafy, pithy bitterness. Balance was OK, same as the beer, tough in a world of awesome pale ales.